Joel and I have known each other since we were 15 and have been playing together, on and off, in one context or another over the years. So when I hear his playing, I hear everything that he and I discovered and absorbed together from the time we were just getting started. It’s cool and a little uncanny, because I hear my own influences and history as a player through him. Hopefully that informs what we got to on this duo record. There’s a rapport we have together musically that’s not unlike certain friendships that you’re lucky enough to have that begin at an early age and last throughout your life: You don’t see each other on a regular day to day basis, but when you come together, you resume the dialogue right where you left off, building on the experiences you’ve gathered since the last time you came together. Joel and I were vinyl junkies throughout high school, and made pilgrimages to a used record shop in Wethersfield, CT, near where we lived. We went through a lot of stages together, absorbing jazz from different time periods. There was a heavy Michael Brecker stage – one of our older classmates, the tenor saxophonist and composer Pat Zimmerli, had us all chanting the ‘Three B’s’ – Bach, Brecker and Beethoven. ‘Three Quartets’, the classic Chick Corea record with Brecker on it, was played non-stop for a while. We discovered Miles Davis together – the fifties band with Coltrane all the way through to his 80’s albums like ‘Decoy’ and ‘Tutu’, which were favorites of ours. We discovered Bird together, and the vocabulary of be-bop slowly entered our playing around the same time. We went nuts over tenor players like Clifford Jordan, Booker Ervin and Johnny Griffin. Joel absorbed a lot of different tenor players and I’d say it was around his 21st or 22nd year that he started to put together his own sound. When I think of Joel, I think of his sound on the tenor, big and generous, very warm and comfortable. He worked toward that for a number of years, and now it’s just there, in everything he plays. A beautiful sound on the instrument is something he obviously values. What Joel had from pretty early on was a certain fluidity in his line, an easy grace to his eighth notes that you can hear on a tune like ‘Oleo’ on this date. The effect on the listener is to put you at ease in that kind of swinging context. It has the same effect on me playing with him – the ideas come out more easily for me when I comp behind him than they do in a number of other situations. 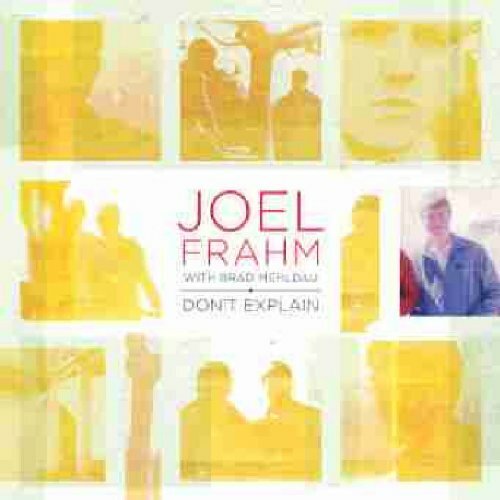 Finally, one thing I always hear in Joel’s playing is an unapologetic emotional outpouring. He’s not beating around the bush as far as that goes. You can hear it particularly well here on ‘Don’t Explain’ – no winking or nudging going on here, just getting to the heart of the song, with all its sadness and resignation, immediately, from the first note. I’m really proud to be on this record and was grateful that Joel decided to do it in a duo context – that was a special treat. Hope you enjoy.